The U.S. government began to collect digital photograph and fingerprint of foreign visitors who need visa for the entry into the nation under a new government program, ‘United States Visitor and Immigrant Status Indicator Technology program’ (US-VISIT) on Jan. 5th, 2004. By October, all visitors who don’t need US visa will also be required to have a biometric passport with fingerprints for entering the U.S.
After the press conference, Choi Byong-mo (Chairman of the Lawyers for a Democratic Society), Kang Nae-hee (Chairman of Korean Progressive Network ‘Jinbonet’), and Oh Chang-ik, (Director general for Citizens’ Solidarity for Human Rights) handed over a protesting letter to the embassy. United States Visitor and Immigration Status Indicator Technology (US-VISIT) has been implemented at 115 airports and 14 seaports in the US. on Jan. 5. This is an identification database system with biometric information including fingerprint and digital photograph of all foreign visitors to the U.S.
All visitors who need US visa should be photographed and take prints of right and left index fingers when they are entering the US and be investigated whether they are on the list of suspected terrorists and criminals. 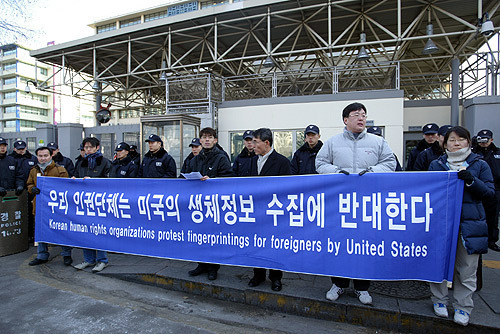 We, South Korea human rights organizations express anger over the US-VISIT system and demand the U.S. stop collecting of the biometric information such as fingerprint and digital photograph immediately. The U.S. Department of Homeland Security says the goal of this program is to track the millions of people who come to the U.S. and to use the information as a tool to against terrorists’ activities. However many experts even in the US questioned the practical application to prevent terrorists’ activities with this system. For example, for those whose fingers and photos have not been collected in the US-VISIT database, the screening process in the U.S. ports of entry will be useless. The measures are only expected to backfire, aggravating the anti-U.S. sentiment around the world. What is worse is that Washington has gone as far as to pressure other nations to issue machine-readable biometric passports. They demand even other visa waiver nations make the biometric passports by October. U.S. Consul-General Bernard Alter recently reportedly said that if the South Korean government does not start issuing passports containing biometric information from August this year, then it would influence whether South Korea becomes a visa waiver nation in the future. We regard his words as an insolent intervention of the other state’s internal affairs of issuing its own passports. Biometric information like fingerprints is one of the most sensitive ones, the surest tool of identification. Leakage of such information could be detrimental to the very holders. Most of all, once a person’s biometric information is collected, it can be easily recaptured in his or her scope of activities without even consent. Thus it should never be easily available for collection and identification and there should be very strict standard and legislation when the personal information is collected and used. To collect biometric information as a national policy is a clear violation of the basic human rights such as liberty of body and private life, broadly ruled in the Universal Declaration of Human Right and other international standards on human rights. It also violates the basic principle of presumption of innocence by treating an individual as a potential criminal. Many countries all over the world have put a strict restriction on collection of the personal information and ban such activities with a long-term and abstract purposes. The U.S. move to collect biometric information mirrors Washington’s wayward attitude to trample on human rights of other nationals with a cause of its own security. It is an imperialistic approach to twist others’ arms and antagonize any dissenters. We also express concerns over propagation of the practice of collecting biometric information. We deem that the discussion on the introduction of the biometric passports will be put on the fast track once the International Civil Aviation Organization (ICAO) publicizes the criteria of the documents. The introduction of the biometric passports can lead to a global-level surveillance over privacy, an expanded version of the state’s watchtower, which the human being have endeavored to minimize in its efforts to enhance human rights and democracy. Now, we witness the state surveillance unprecedently begin to cover not only the nationals but all the human beings. Against this backdrop, people who are concerned over the human rights and oppose any national-level or global-level intervention of privacy have no choice but to stand against the US-VISIT. Since the Sept. 11 terrorist attack, each countries’s government have granted greater authorities to their intelligence agencies and strengthened surveillance system over their nationals. A lot of human rights groups criticized it very strongly. The U.S. introduction of the security system has now touched off another round of protests in this regards. In whatever condition, we can never give in during this campaign, as we are no longer human being when we give up our due right as humankind. Last but not least, we feel startled over the fact that the South Korean government has no position to this US policy. While other governments of Brazil and Poland are expressing concerns to this US policy, it does not seem to have lifted a finger on the issue. It worries us whether the South Korean government agrees with the Washington’s move or it will go as far as to adopt biometric passports, degrading itself to an accomplice to the international surveillance system over privacy. We, human rights organizations, can not repress the anger over the U.S. decision and now delivers the written protest. We once again demand the U.S. stop this measure immediately. If the U.S. government goes on with the collection of biometric information, we will fight against it hand in hand with other human right groups all over the world.